Ever since her best friend died six months ago, Laura Reihl has vowed to make each day count. And that means she should probably break off her relationship with Rudy. They’ve been together for so many years, and his friendship means the world to her. But she knows friendship doesn’t come close to the fireworks of true love, and she’s not really feeling the fireworks. So when Savilla’s widower, Allen, asks her to help him take care of the baby Savilla left behind, Laura jumps at the chance. Maybe the change of scenery will help her gain perspective on her relationship with Rudy. And she’d do anything to help Allen out—he’s always been a good friend to her, and he’s Rudy’s best friend as well. When she arrives at Allen’s house, though, she finds a man she barely recognizes. Allen is distraught over his wife’s death, blaming himself for not taking her to the doctor soon enough. As Laura helps Allen work through his grief, she remembers just how easy he is to talk to. And she discovers an attraction she’s never felt with Rudy. She can’t be falling for Allen, can she? It would be a betrayal to the two people she’s care most about, Savilla and Rudy. But if she denies her feelings, is she betraying herself? 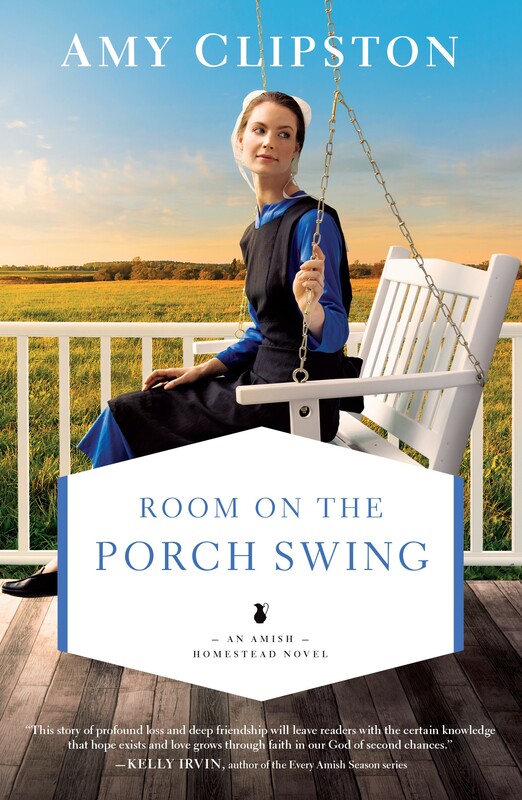 Room on the Porch Swing is the second book in my Amish Homestead series, and I'm certain it's going to be my favorite. Before I even started writing it, the characters began speaking to me, meaning I could envision the story playing out in my day dreams. In my mind, I could hear Laura Riehl and Allen Lambert talking to each other while sitting on a porch swing at Allen's house. This book has a special place in my heart, and I hope readers enjoying reading it as much I enjoyed writing it. This book is dedicated to my husband Joe.